Chinese cabbage, also known as napa cabbage, is one of those vegetables that are seriously under-utilised. I love the fresh, crunchy texture served shredded with tangy dressings and noodles, just like this dish I’m posting today. Although you could serve this warm noodle salad on its own, we like to eat it with roasted or barbecued chicken that’s been drizzled with a little chilli oil. I chose Japanese soba noodles, made from buckwheat flour, for this recipe as well as tangy Chinese black vinegar and sesame oil. This is a great meal for when you’re short on time. It takes about 20 minutes to prepare, including chopping and cooking the noodles. 1. Whisk together the soy, vinegar, sesame oil and vegetable oil until well combined. 2. Stir through spring onion then season to taste. 3. Toss cabbage and noddles together while noodles and still warm. 4. Dress with vinegar and oil to taste. This is my contribution to Presto Pasta Nights, hosted by Cassie at The Kitchen Alchemist. Be sure to visit her blog for the recap. A few weeks ago I participated in a very exciting event organised by Meat & Livestock Australia (MLA) and hosted by Warren Turnbull and his team at Assiette. 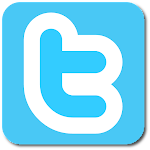 A lot of organisations are jumping on the social media band wagon, not understanding the differences between social media and traditional media. You can’t just broadcast one-way to bloggers and expect them to pick up your content with interest. Blogging is about interacting with your readers and the world, not just a blathering monologue. The point I’m trying to make here is that MLA created a social media event to draw food bloggers in a fundamental way: they made us the event. Clever. 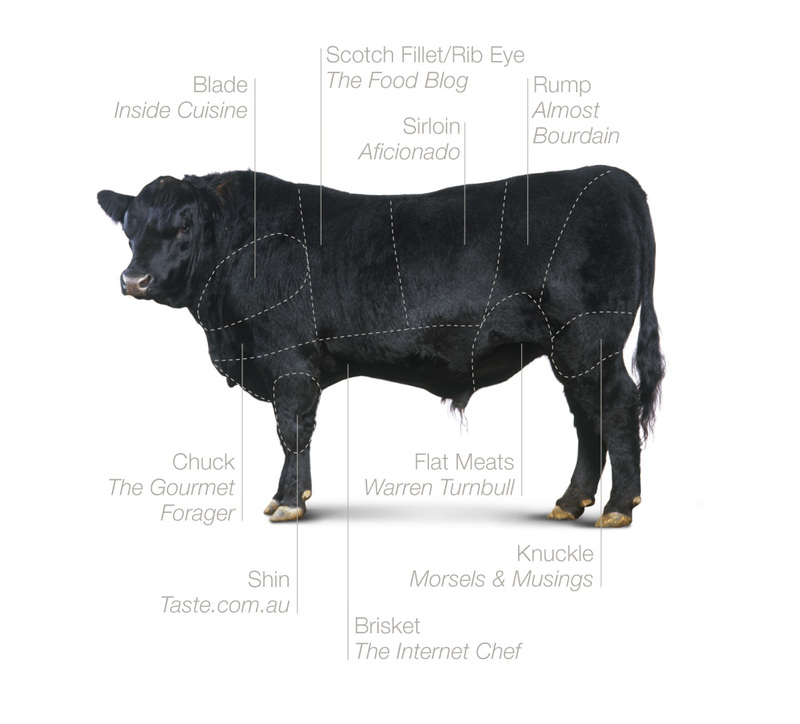 So, eight bloggers were invited to learn more about beef with the help of a well-known Sydney-based chef, Warren Turnbull of District Dining and Assiette. Each of us were allocated a cut of beef to create our own recipe and then Warren and his team would transform it into a restaurant dish for a special degustation dinner. Genius. Beef producer, Alison McIntosh, handed over one of her prized Angus steers and Anthony Puharich, CEO of Vic’s Premium Quality Meat and owner of the fabulous butchery Victor Churchill, made the cuts and shipped them out. I got given the beef knuckle. 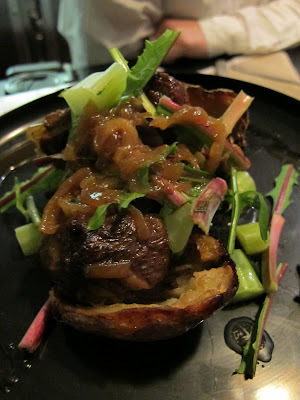 I had no idea how to cook a beef knuckle or even what it looked like! I thought it might be something I’d need to braise for hours. Nope! Luckily Warren explained that a beef knuckle is a big slab of meat, often called a beef round, and is usually slow cooked as a roast. One of the best parts of the challenge was talking through my ideas with Warren. It was fun to workshop recipes with a chef and even more rewarding to introduce him to some new ingredients (like hominy and achiote). I think he was pretty excited about the opportunity to experiment too. I steered him towards a pozole recipe, and he encouraged me to give curing a go. I think we were both happy with the results. 1. Grind the peppercorns and coriander seed with a mortar and pestle until coarsely crushed. 2. Add sugar and salt and grind a little. Add oregano. 3. Mix achiote paste with tequila to loosen it up, then add to sugar and salt. Mix until it has the texture of wet sand. 4. Lay a few layers of plastic wrap down, then coat all sides of the meat with a thick layer of the curing mix. 5. Wrap tightly then refrigerate for 24hrs (use a plate in case it leaks). 6. The next day, unwrap the meat and scrape off all the curing mixture. Wash and pat dry with kitchen paper. The meat will be darker and the exterior will have hardened a little. 7. Preheat the oven to 170’C (350’F). 8. Mix together the olive oil and extra achiote paste as well as you can. Rub the achiote oil mixture all over the meat. 9. Place on a roasting rack in a roasting tray. Set aside and allow the meat to come to room temperature. 11. Remove roast and allow to sit for 20 minutes before cutting. Serve in thin slices. 1. In a medium saucepan, bring water to a boil. Add pozole and cook for 15 minutes. Drain. 2. Heat olive oil in heavy based saucepan. 3. Add achiote paste, onion and garlic. Mash paste throughout and fry until mixture becomes dry. 4. Add chipotles and fry a little. 5. Then add tomato paste and fry until thickened. 6. Next add beef consommé and sugar and bring to the boil. Simmer for 10 minutes. 7. Add pozole and simmer a further 5 minutes. 8. Remove from heat and stir in lime juice to taste. 9. Ladle soup into bowls. 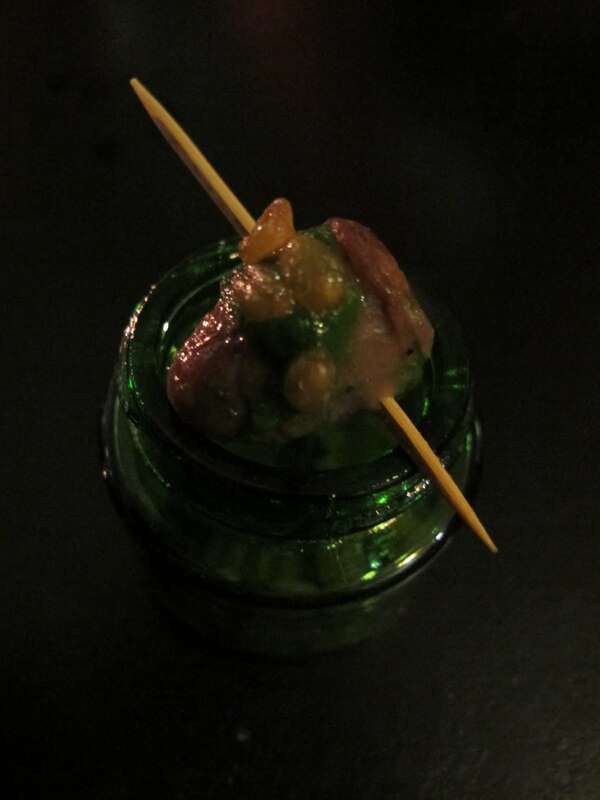 Pass garnishes separately so people can add to taste. So, how did it look when Warren and the team were done with it? Much more beautiful of course! 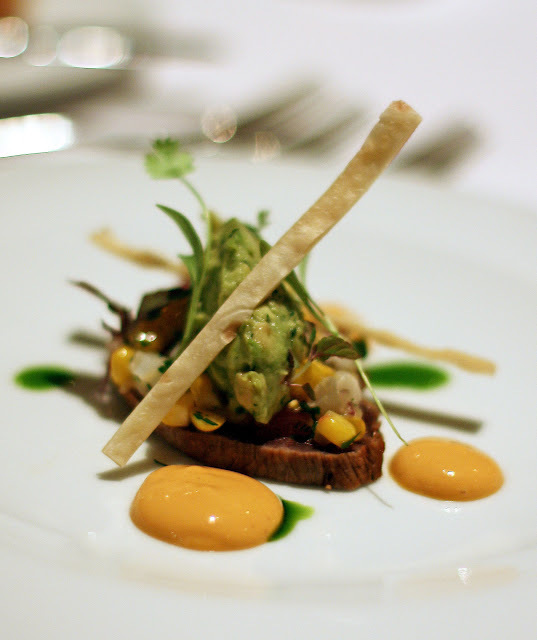 It’s actually amazing to see how much skill and artistic talent chefs bring to humble home cooking. Warren said they stuck to the curing recipe pretty closely, but reduced the tequila. But the biggest difference was the addition of agar agar to the soup broth transforming a warm dish into a cold one served with a thick sauce rather than soup. The Assiette team were quite nervous that I wouldn’t like it, or that the flavour of the soup wouldn’t be the same, but once you mixed all the ingredients together and started to eat it could have been the very same dish as mine. It was quite an amazing experience and the best social media PR event I’ve been invited to take part in because we were truly included rather than just bystanders. Kudos to Haussmann Communications for coming up with it and bravo to MLA for having the sense to agree. Take note other PR agencies! 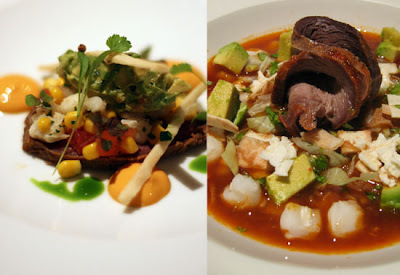 The full list of dishes served on the night really showed the diverse ways beef can be cooked and eaten. Autumn means pears, and I love pears. Juicy, sweet and versatile, pears are such a wonderful fruit to have around the house. Recently I was given a box of luscious Red Sensation and Packham pears as part of a pear promotion: Rediscover the Pear. They were just wonderful. I was thinking about the great chocolate and almond tarts my colleagues and I buy from Central Baking Depot and I decided the sturdy Packham pears would be perfect to help me recreate the tarts at home. I used Carême Pastry frozen dark chocolate shortcrust for this Jamie Oliver recipe, which turned out to be mighty fine and certainly on par with the tarts I was dreaming about. Recipe by Jamie Oliver. Serves 6. 2. Roll out the pastry until ½cm thick and use it to line a 24cm tart tin. 3. Leave in the freezer to rest for at least 20 minutes, or longer if you can. 4. Bake the pastry blind for around 10 minutes in the preheated oven, then remove, set aside, and reduce the oven temperature to 170°C/325°F/gas 3. 5. Mix your almonds, eggs, butter and sugar together and stir in the melted chocolate while it’s still warm. 6. Pour the mixture evenly into the pastry case and then press the pears into the chocolate and almond mixture. 7. Bake the tart for 45 minutes until the pastry is golden brown and the chocolate and almond mixture is firm. 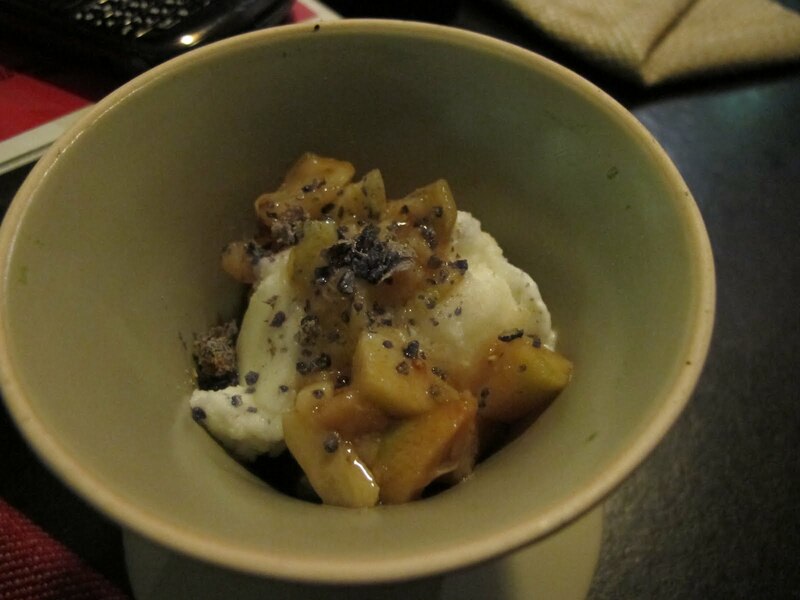 I served my tart with the most exquisite accompaniment of all time, David Lebovitz’s Pear Caramel Ice Cream form The Perfect Scoop. 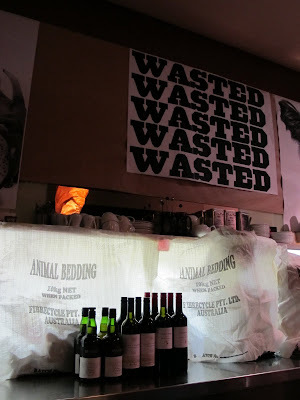 Last night Jonas and I enjoyed the Wasted pop up dinner at Ten Buck Alley, celebrating the unloved bits of animal and vegetable often neglected from restaurant menus. It's a limited time event on Thursday 12th, Friday 13th and Saturday 14th May. Despite it being Friday 13th, our hosts, British chef Douglas McMaster and self-confessed pop-up restaurant vigilante Kym Lenoble, put on a good show. 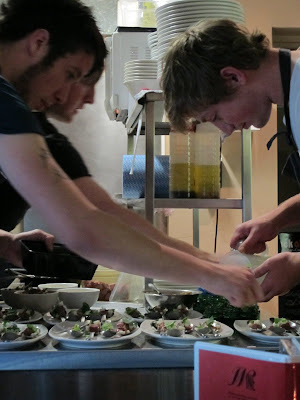 It sounds cliché, and Jonas will certainly roll his eyes at me, but it’s great to see chefs so excited and passionate. I’m a big fan of these pop-up events because they give younger chefs and sommeliers a chance to be inventive and test their mettle. We filed in, group by group, into the tiny café. It had been spruced up for our arrival with some quirky decorations and scenes from the 1995 post-apocalyptic film Waterworld projected onto the wall. As Kym said, Waterworld is what we’ve got to look forward to if we don’t start eating and living more sustainably. Seating was tight. Tables were flush against each other and elbows knocked. The small, backless stools were a touch uncomfortable for such a long meal, but the squashy set up meant I could lean on the person behind for support. 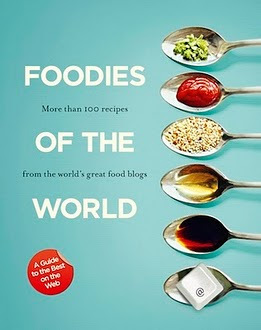 Lucky for me that person turned out to be a blogger I already knew, Minh from Eat.Show.Tell. The night got rolling with a wonderful Dragon Fruit Bellini, the dragon fruit (pitaya) giving an elegant flavour to the sparkling wine, which became tinted a pretty pink from the fruit. 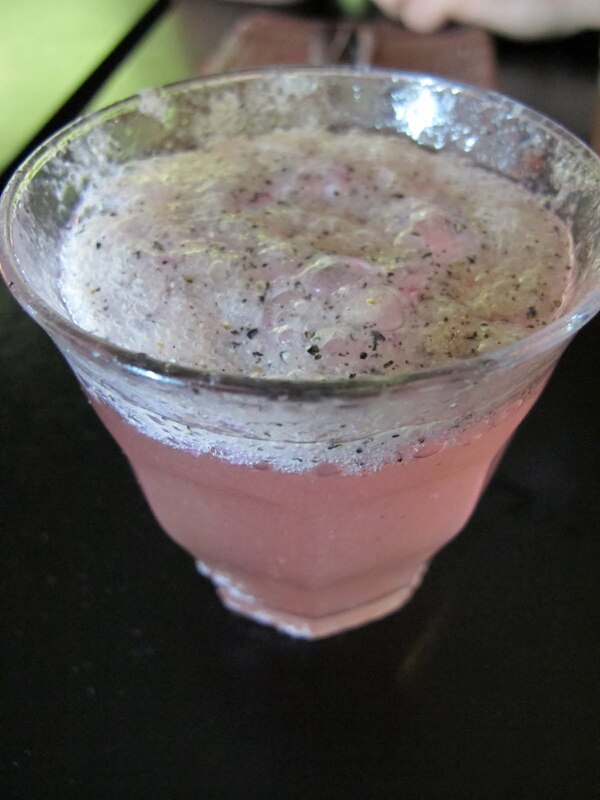 Unfortunately there’s a certain sliminess to dragon fruit that floated to the surface of the bellini, forming a lipidic foam, but it was easily dispersed with a quick stir. Visually it needs some finesse to avoid the foam, but I could easily steal this one for a dinner party. Two amuse bouche kicked off the food. 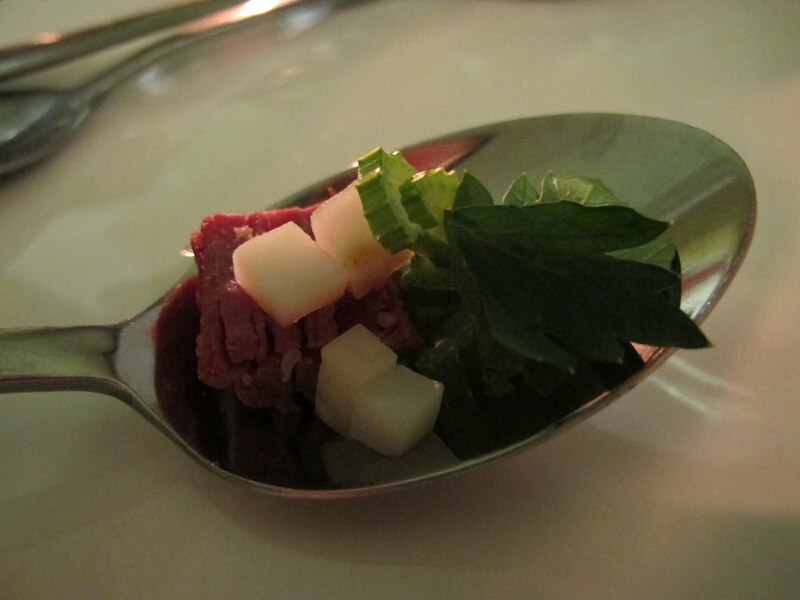 First a spoon of salt pork, pickled celeriac and the fresh celery leaves. As a celery hater I was surprised to discover the celeriac root gave a fresh flavour when pickled and the leaves were very mild. The salt pork was delicious. A nice intro. Next up was a tiny green jar with an equally tiny chicken heart, smothered in puréed dock weed and accompanied by some roasted wheat kernels. The dock weed’s acidity was a perfect match to the iron flavour of the heart. Another winner. While we waited for the team to prep our first course, they passed around ikan bilis (dried anchovies) and anchovy mayonnaise. 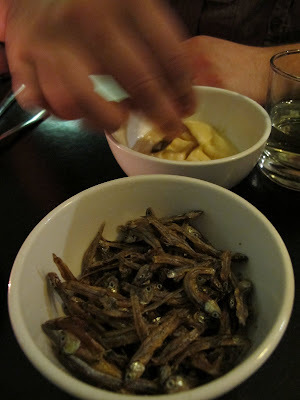 It was like fishy chips and dip, enjoyed by many more people than I would have imagined given the strength of flavours. Tick! Our first course, a Nettle Soup, had a beautiful creamy texture and subtle verdant flavours that would have been lifted to dizzying heights with a little seasoning. As we discussed with our neighbours, including Daisy who blogs for London’s Evening Standard, so many young chefs are often afraid of salt. Fortunately, tiny cubes of crackling-like back fat floated throughout providing mouthfuls of nutty pork flavour. 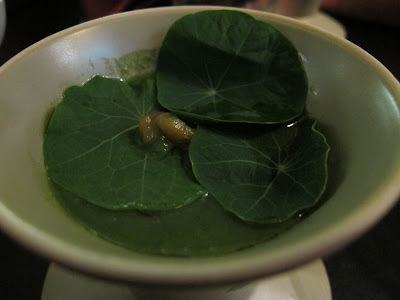 The decorative nasturtium tasted like wild salad leaves. It was a restorative course, served with an unwooded 2010 Printhie Chardonnay (Orange, NSW). Without the food it tasted a little unfinished, heavy on alcohol at the end, but after tasting the soup the wine balanced out perfectly. The anxiously awaited Blood, Brains & Skin course was the most frightening dish for the majority of the crowd. Thickened blood sauce, flavoured with caraway seeds, was a bed for lamb brains fried in a mixture of breadcrumbs and pork crackling. It was all topped off with micro herbs and tart pickled apple. Served on large square tiles, this was my favourite course of the night. It could easily have featured on any 3 hat/star restaurant menu. The pickled apple gave fresh acidity, the brains were flavoursome and soft, but not limp, and the crackling added a wonderful crunchy texture contrast. The blood sauce was a rich punch to the softness of the other flavours, but many found its presence psychologically overwhelming. Not me. I could have eaten another two plates of the stuff! 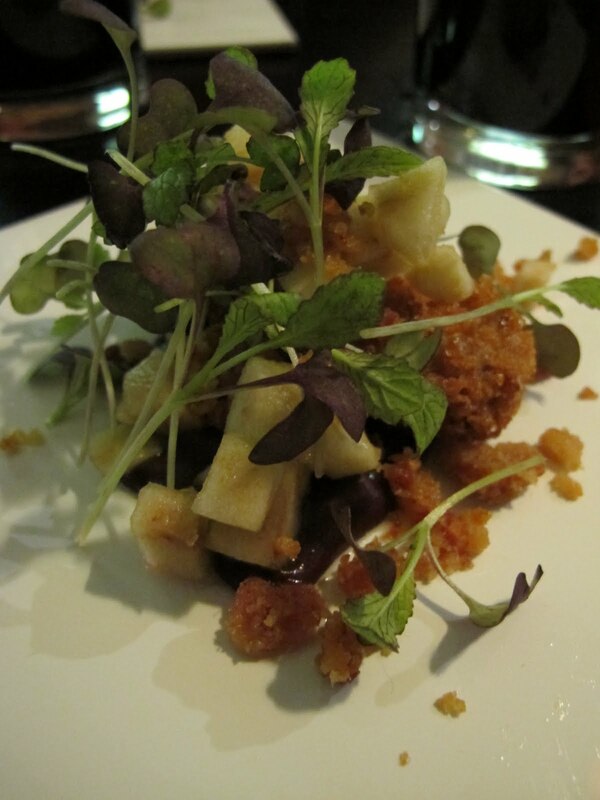 The brains were paired with the gutsy 2009 Devil's Ridge Block 22 Cabernet Sauvignon (Barossa Valley, SA). This wine was lovely. Low on tannins, and strong with cherry and anise. I’m going to keep a look out for this one in the stores. Ironically, the yabby course was the most challenging for me, simply because it contained dill - my most hated of herbs. 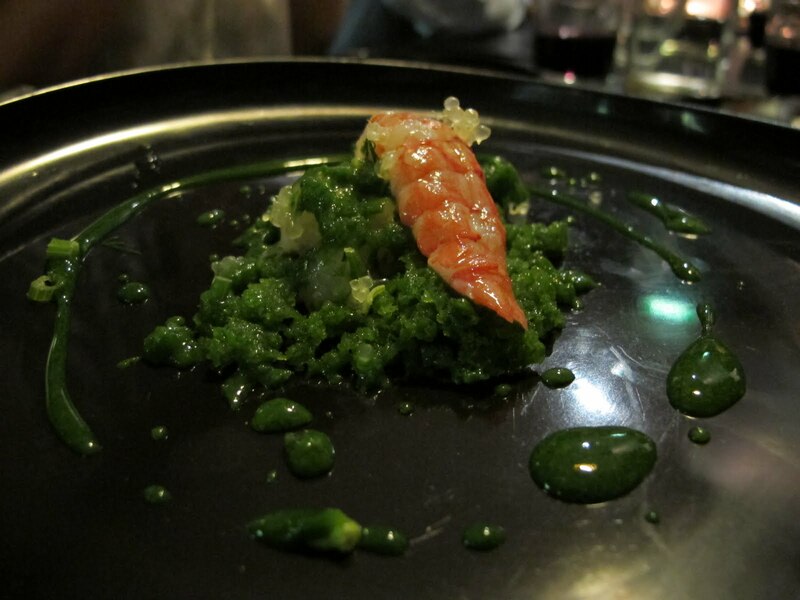 The velvety texture of the yabby tartare was perfect, a sweet and striking contrast to the intense vegetal flavours of the wild rocket granita. In the dim light and intense green of the plate, the finger lime caviar disappeared visually, but the bursts of fresh acidity in the mouth proved they were there. Again, a sprinkle of salt flakes would have lifted the flavours of the yabby and rocket dramatically, and perhaps curtailed the overpowering dill. The flavour from the stems is stronger and more anise than the commonly used tips and the stringy texture was also a turn off. Jonas and our neighbours had no such issues with the dill, adoring the fresh, clean flavours, but everyone agreed salt was needed. I love that they served the yabby course on plastic black Frisbees. Afterwards we checked out the bottom and discovered they were promotional items from Espirit. Talk about recycling! 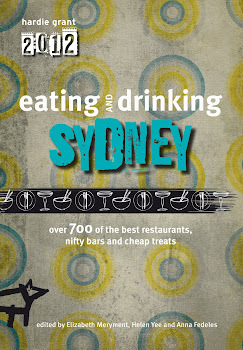 It worked well with the 2009 Brokenwood Semillon (Hunter Valley, NSW), matching the acidity of the finger lime. Our last savoury course were beef intercostals, cooked into soft, gelatinous sweetness and accentuated by caramelised onions. They were served in crispy carved out potato skins and topped with cauliflower stems. One of the groups sitting next to us were extra anxious as to what intercostals might be, but I assured them it was nothing dramatic: merely the muscle tissue between the ribs. The matching wine was the 2008 Grant Burge Miamba Shiraz (Barossa Valley, SA) fruity and thick with chocolate, liquorice, plums and cherries. The palate cleanser and first sweet course was a whey sorbet, sprinkled with crushed crystallised violets and chunks of fresh feijoa. Jonas found the feijoa fruit overwhelming and pungent, whereas I enjoyed the sweet-sour tropical flavour, similar to a guava. The whey sorbet was quite sour, almost salty and entirely delightful. This came with a delicate and sweet 2009 Batasiolo Moscato d'Asti (Piemonte, Italy). 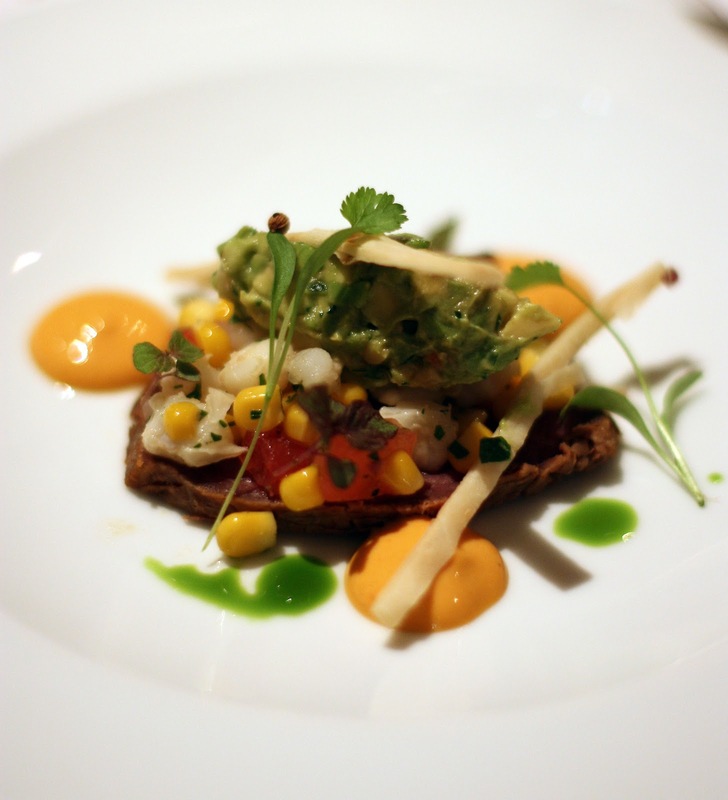 Our last course was a salute to the New Nordic food movement. 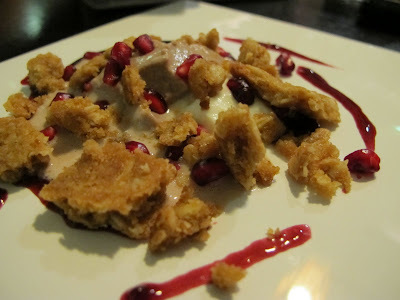 A layer of molasses sauce was topped with natural yoghurt, a smoked custard mousse and splashes of reduced pomegranate juice. All decorated with glistening ruby pomegranate jewels and chewy crumbs from an ANZAC type biscuit. The yoghurt counterbalanced the sweetness of the molasses while the earthy pomegranate mixed well with the smoky wooded custard. And who doesn’t like ANZAC biscuits? C’mon! This was paired with the Buller Tokay (Rutherglen, VIC), sticky and strong enough to match the smoked custard, but probably the weakest wine pairing of the evening. We left the evening impressed with these young whippersnappers. The food had focused on sustainable nose-to-tail or foraged ingredients and the wine matching was inspired with inexpensive options signing like a well practiced choir beside their partner course. They'd managed to turn the ugly and the under-utilised into something wonderful. Overall a thoroughly enjoyable evening, heralding many good things to come from Douglas McMaster and Kym Lenoble. Anna & Jonas were NOT guests of the Wasted team and paid $123pp for 6 courses with matching wines. These carrots were braised with white wine, garlic, thyme and chicken stock. It was, simply put, quite delicious. The gorgeous colour of the carrots added oompf to the visuals of meal and I’m sure there’s something marvelously healthy about all that purple pigment. Antioxidants or some such bafflegab. Interestingly, the carrots leach their colour out so it looked like I'd used red wine. I didn't. Just plain old white wine. The flavours are intense of carrot, herbs and a touch of wine and as you can imagine this dish tasted beautiful alongside Grilled Goat Cutlets & Rhubarb Agrodolce Sauce. Anna's very own recipe. Serves 4-6. 2. In an oven proof pot, heat the olive oil then add carrots, garlic and thyme. 3. Add salt and pepper to taste then stir, frying until garlic softens (around 5 minutes). 4. Add wine, then bring to a boil. Cook off alcohol for around 2 minutes. 5. Add stock, bring to a boil. 6. Cover pot, place in oven and braise until carrots have softened but still have some texture (around 10-20 minutes). 7. If you're not vegan, this is the point you add butter for a little extra richness. Stir to melt and combine. Serve dish hot. Note: some people place a piece of baking paper on top of the carrots when they’re in the oven to retain moisture. I didn’t, but everyone’s ovens are different so use your judgement. 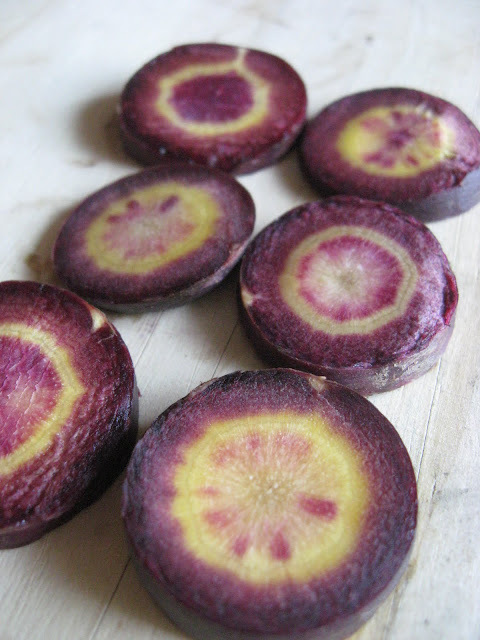 These beautiful heirloom carrots are my contribution to Weekend Herb Blogging, this week hosted by Astrid at Paulchen's Foodblog. Be sure to visit her blog for the round-up.